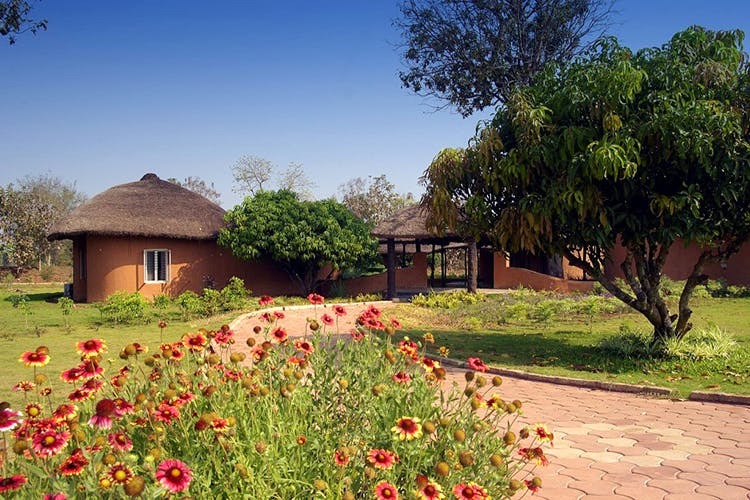 If a weekend getaway is on cards, a drive down to this wildlife resort is recommended. Kings Sanctuary is for the wildlife enthusiast in you and for those looking to unwind in a natural environment. Located on the northern fringes of the Rajiv Gandhi National Park in Nagarahole, Kings Sanctuary is an eco-friendly resort set amidst mango orchards and lush lawns and comprises cottages, villas, and luxury suites. It’s perfect for weekend getaways with the squad, fam-jam or even with your office folks. Furthermore, the Nagarahole Tiger Reserve, home to over 50 adult tigers, herds of Asiatic elephants, and other species of mammals, reptiles, and birds, is what will bring out the Steve Irwin or David Attenborough in you. Plenty of opportunities to see wildlife up close, packing your DSLR is highly recommended. And binoculars too. Guided tours to the reserve are arranged on prior notice, so be sure to put that first on your itinerary. The resort’s accommodation is split into cottages, villas, and suites with the clusters of cottages and villas having a similar layout — cosy and private with a verandah. The clusters are arranged in such as way that there’s a central courtyard in between and it often acts as a hub for activities or just lounging around. The luxury suites, on the other hand, are situated near the lake. Need we say more? Yes, we should as these luxury suites, just like the cottages are spacious, come with a living room, and are tastefully decorated using renewable resources like cane wood, weeds, and banana fibre. The cottages and suites are priced at INR 11,000 for single occupancy, while the villas can be booked off for INR 15,300 for single occupancy. All these rates are on per night basis and an American Meal plan that includes accommodation, breakfast, lunch, dinner, and use of resort facilities. Since the national reserve is next door, the best thing to do around these parts is to go on a jungle safari. A 6-person guided jeep tour will take you around the reserve and up close with the wildlife. In case you are in for a long weekend, there’s plenty for you to do around the resort as well. For starters, there’s an open-air swimming pool for you to take a lap or two. Regular games such as Table Tennis, Volley Ball, Cricket, and Chess are available, but if you are looking for something more adventurous then paintball, Burma bridge, jumaring, and land zorbing are there for you to try.